Hello Darlings, What would be a lovelier way to spend a Sunday afternoon if not sipping on champagne, soaking up the sunshine and enjoying a polo match benefiting Heart and Stroke Foundation? That's exactly what I had the pleasure of doing a few weekend ago at the 36th annual Polo for Heart match. The weather was perfect, the company fun and the experience made for new memories! Surrounded by the beautiful setting of the Toronto Polo Club, from the elegantly appointed Ritz Carlton Pavilion I had the pleasure to watching my first polo match. As the champagne flowed and the elegantly dressed onlookers enjoyed the match between Canadian and Irish international teams, we also had the pleasure of celebrating the home win. 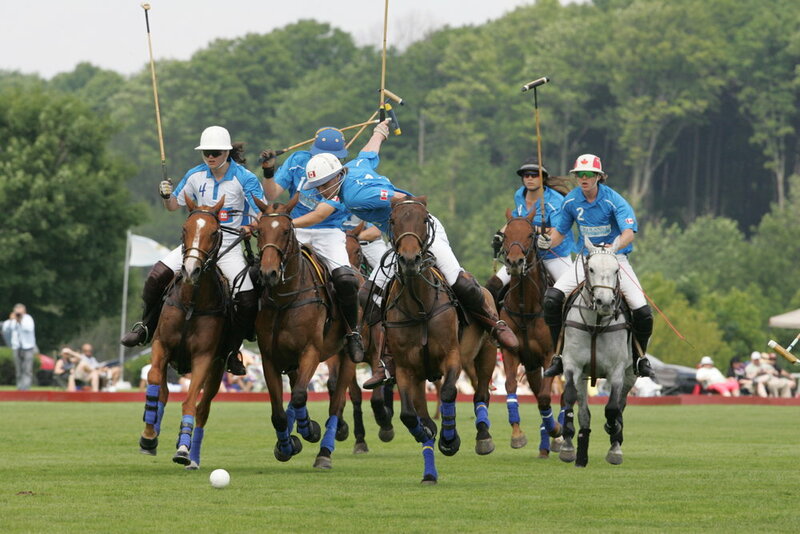 Of course the much anticipated half-time tradition at every polo match is the champagne divot stomp. Yup, ladies and gents you are required to get on your feet and get working filling in those divots! I had my very own Pretty Woman experience as I gladly turned over the patches of grass while sipping of champagne and mingling with other enthusiastic onlookers. During polo play patches of grass are torn up by the horses quick starts, stops and turns, creating divots posing a potential safety risk. A half-time tradition developed out of onlookers having a blast "stomping" the divots back in place to ensure the safety of the horses and players. It's also such a fun way to meet new people! Naturally with traditions comes an expected form of etiquette and a dress code, therefore a girl better know her way. Polo matches do not come without their own intimidation factor when attending for the first time. So think conservative and conduct yourself in the most ladylike manner. Since stomping of the divots tradition is the most celebrated part of the match, wearing high heels is not an option therefore a pair of chic flats or shoes with a wedge or platform are best. Also keep in mind that just because it is a Sunday afternoon affair, polo is not the time to dress weekend casual. Be sure to dresses elegantly in chic attire. As this was my first polo match, my direct inspiration came from Julia Roberts in Pretty Woman, except unfortunately I had absolutely no luck at finding a beautiful hat. So ladies, if you do have the luck be sure to rock one. Instead I decided on girlish drop waist The Fifth Label dress with a pair of delicate satin Tabitha Simmons wedges. The look was a success with a number of kind compliments, so when in doubt go with a conservative look and a touch of pastel. It was a day filled with lots of new memories, now a polo match can be crossed off my bucket list!